Scientists have warned that a million people living on the shores of Lake Geneva could be at risk from devastating tsunamis. In the sixth century a tsunami triggered by a rockfall on the lake destroyed several villages, sent a 26 ft wave crashing over Geneva’s city walls, and caused many casualties. Experts investigating the event said a similar disaster could easily happen again, and Geneva with its 200,000 inhabitants was especially vulnerable. They argued that the threat of lake tsunamis is underestimated and should be taken more seriously. The Lake Geneva tsunami followed a documented mountain rockfall, known as the Tauredunum event, in AD 563. A survey, analysis of sediment cores and computer simulations suggested that the rockfall caused a huge mudslide where the river Rhone flows into the lake. The resulting displacement of water generated large tsunami waves, including one 13 metres (42 ft) high where Lausanne now lies on the lake’s northern shore. An eight metre (26 ft) high wave hit Geneva 70 minutes after the initial mass movement of sediment. The city is right at the other end of the lake from the mudslide, a distance of more than 70 kilometres. A reconstruction showed that the wave would have destroyed Geneva bridge and breached the city walls, as reported in historical records. “Today, a wave of this height would completely inundate large parts of the inner city of Geneva,” the researchers wrote in the journal Nature Geoscience. They pointed out that the event which triggered the tsunami was “by no means unique”. Seismic records showed that large mass movements of sediment had been generated on the lake several times in the past 12,000 years. Any of these could have triggered destructive tsunami waves. 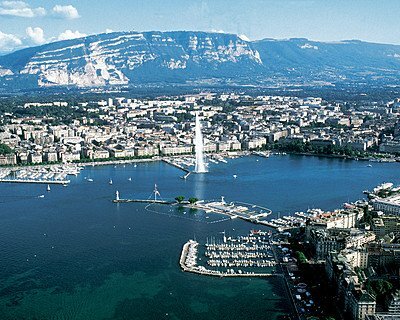 The scientists, led by Katrina Kremer, from the University of Geneva, wrote: “Given that riverine sediment input is still loading on the slopes of the Rhone delta, tsunamis may well occur in Lake Geneva in the future, whether they are triggered by rockfall, earthquakes, or simply large storms, resulting in slope failure. “Such tsunamis … pose a direct and hitherto largely ignored threat to at least a million people living along the lake shores. They added: “Our study highlights that not only cities located on sea coasts and fjords are at risk from destructive tsunamis, but so are densely populated lake shores.